When asked where she’s from, Wendy Rudder has difficulty pinpointing one place. A Canadian citizen who was born in Trinidad and raised in Barbados, she has lived in multiple countries. 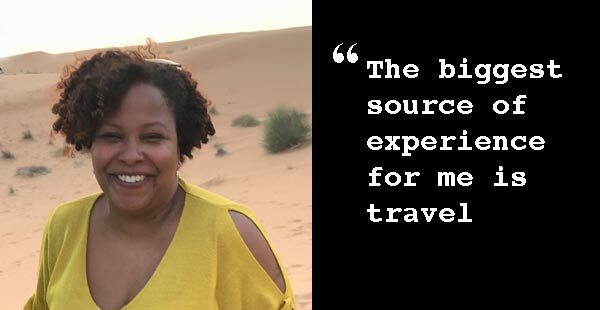 It’s not a surprise that, although she now lives in Amsterdam, she enrolled for our online course because “people can be anywhere in the world and take the class…people from many different backgrounds, who all have this passion for writing in common”. Despite a demanding job as a consultant helping companies define and implement digital strategies, Wendy manages to fit writing into her life and still leave plenty of time for her fiancé Rico. She first got into writing when she created a children’s book for her niece and nephew seven years ago. A valued member of our online Level II workshop, Wendy is now working on her first novel. You can read some of her pieces on our Facebook page where we like to feature a standout exercise each Friday—a poem based on the experience of a family member who left Barbados to dig the Panama Canal and a flash fiction piece featuring a dramatic meeting. Q. How has writing influenced other aspects of your life? A: I think it’s made me more reflective in a way. I have another channel to process thoughts and explore ideas that I didn’t before. Also I think it’s made me more observant. I’ll notice something on the tram, or overhear a conversation and kind of store it up like a little treasure for the future. I don’t always know why something clicks, but I do notice when it happens. Q. Where do you get your material from? What inspires you? A. Well, connected to what I said earlier, there are so many things always happening around us. I try to stay off my phone when I’m in public spaces, to indulge in good old-fashioned people-watching. Of course, good writing also inspires me. I don’t fall asleep each night with a book in my hand (like I did as a teenager), but I do still read a lot. I also think it’s interesting to think about things from a perspective different to my own, and see if I can capture something that has depth, that feels real. Q. What do you have stored away in your experience library that you think you might draw on one day for your writing? A. I think the biggest source of experience for me is travel. In addition to the places I’ve lived, I have also done a ton of travelling for work in my previous job. I’ve met flight attendants who told me I flew more than they did in a week. So, I have a store of locations and experiences associated with travel. I can probably describe several airports and hotels from memory. For a long time, I had a series of social media posts called Airport Chronicles that my friends loved. I’m working on a novel project now and it’s fun to put my character into locations and scenes that I can describe from my own personal experience and memories. Q. What’s on your list of favourite reading? A. As a kid, I read every Anne of Green Gables book at least three times. I developed a love of mysteries as a teenager and still read a lot in that genre today, as well as historical fiction. Favourites that I come back to again and again include The Outlander series (before it came to TV!) and The Flavia De Luce series by Alan Bradley. I also have a guilty indulgence for vampire chic lit! Q. What’s a strange fact about you that would surprise your classmates? A. Well I don’t know if it’s strange, but it is less known that I’m a pretty good singer. I sang in church and school choirs for years and have always loved to sing. I’ve written a few songs with my mom, who is also a musician. I can generally pick up the words to a song after hearing it twice, and I have been known to drive my brothers crazy by constantly singing along to the radio! 0 responses on "Global nomad finds community online"